Around 1884, Alhambra citizens saw the need for their own school. Two elections failed, largely because of the powerful resistance of the San Gabriel School District. Alhambrans then petitioned for a partitioning of the district and agreed to placate the San Gabriel District by giving San Gabriel a school at Vega and Main. Old Mill Creek became the dividing line on the east, with a deviation that gave San Gabriel the school. The new principal Sebastian Shaw and the Alhambra students set up classes in an old redwood cabin on property on South Chapel near Beacon Street. A fire hydrant across the furrowed field on Garfield Avenue provided drinking water for the school. When the roof caught fire one day, the children used their dinner pails to bring water to douse the blaze. A $10,000 bond election was passed to build a school and a site was purchased for $175 at Garfield and Alhambra Road. There a four-room, two-story frame building was constructed. In September 1887, the school opened with 27 elementary and high school students. A Mrs. E. Jones was the teacher and principal. The cornerstone for the current location of Alhambra High School was laid in April of that year. 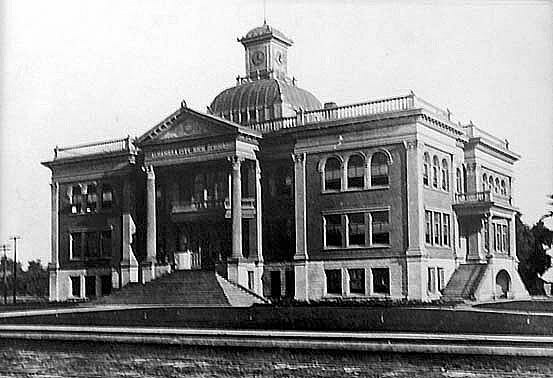 Alhambra High School opened in 1898, between Second and Third Streets, south of Main Street. A majority of the campus was rebuilt in the 1960′s. The addition of the C and D buildings were completed the mid 90s. In 2010, the S building opened and featured 10 state of the art science laboratories opened. In early 2007, Alhambra High School was one of a select few public high schools in California to be awarded a distinguished Great Schools Rating of 8 out of 10. In addition, AHS is currently ranked as a Silver Medal Award winner by US News and World Report tops American High Schools. Enrollment at AHS is around 2800 students. Alhambra High School is one of the three comprehensive high schools that serve Alhambra Unified School District. We’ll recall the name Alhambra Speak of her with pride.